(Mar 18): Last week, I talked about how it can be difficult to interpret published financial statements because of overly ambitious objectives of the accounting profession, evolving reporting standards and the resulting vagaries that could sometimes translate into risky propositions for those relying on them to make investing decisions. This is made worse as financial instruments get more complex, so too their accounting treatments. Singapore-listed Hyflux, I believe, is one good example where a deeper understanding of the accounting behind its reported earnings and perhaps a different way of presenting the numbers could have warned investors of impending troubles. Its financial woes are now clear for all to see and investors-creditors are facing huge losses under the proposed restructuring plan. It was a stunning fall from grace for a company that was once called the “poster child of entrepreneurship”. The company had a compelling narrative for investors and what appeared to be a solid track record. It was a rags-to-riches story for founder and CEO, Olivia Lum, an orphan who grew up in Kampar, a small Malaysian town in the state of Perak. She paid her own way through college working part-time, selling things from jeans to cosmetics to insurance, and then working as a chemist with a pharmaceutical company before starting Hyflux in 1989. The company quickly made a name for itself as a fully integrated water, power and wastewater solutions provider, from design to construction to operations and maintenance. Its proprietary membrane technology to recycle water became a market-leading brand in the growing water industry. Over the years, Hyflux won projects from MNCs, expanding its footprint from Singapore to Asia-Pacific, China, the Middle East and North Africa. Hyflux made its debut on the Singapore Exchange in 2001. At its height, the company was worth $2.1 billion and Lum featured on several of Singapore rich lists. The country’s sovereign fund, Temasek, was once a shareholder in the company. Its reputation was further burnished in 2011, when it won the concession to build and operate the $1.1 billion Tuaspring Integrated Water and Power plant. How did the company run aground from such lofty heights and were there red flags? We tabulated its earnings and cash flows since listing, breaking the 17 years into two broad periods: 2001 to 2010 (Table 1) and 2011 to 2017 (Table 2). The company performed very well in the first 10 years. Revenue grew from $27.2 million in 2001 to $569.7 million in 2010. Pre-tax profit rose more than 10-fold from $9.4 million to $100.5 million over the same period. In 2010, profits peaked. Thereafter, earnings started to decline, noticeably in 2013 (to $51.6 million), then more sharply in 2016 ($0.8 million) before turning into a huge $138.4 million loss in 2017 (including Tuaspring). Many of the reasons for the decline in profits have been well covered in recent reports, including the sharp drop in wholesale electricity prices because of industrywide oversupply, operational issues resulting in below-optimal production levels as well as project delays. 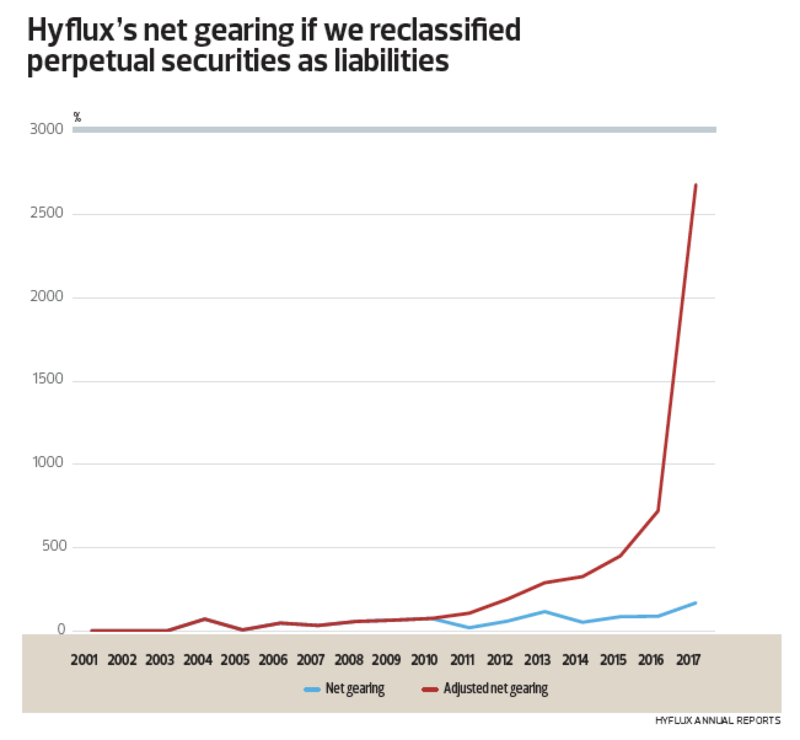 In addition, Hyflux’s business model — and decision to fund growth with debt — is highly dependent on its ability to sell concession assets (and recycle capital) while retaining the long-term operation and maintenance concessionaires. However, the company was finding buyers hard to come by. Nonetheless, these are common business risks and it is not my intention to question management decisions with the benefit of hindsight. In any case, all of us make mistakes, unless we never decide on anything in life. What I do wish to highlight is how prevailing accounting standards may have facilitated the debacle. For example, adoption of the INT FRS 112 Service Concession Arrangements in 2007 allowed the company to recognise construction revenue from in-house concessionaires as well as the fair values of future income streams under the long-term agreements with municipals and utilities. The financial receivables/intangible assets are then recognised as profits over the concession period based on average forecast sales and profit margins after applying an appropriate discount rate. In effect, the accounting treatment resulted in steady recurring annual profit over the 20- to 30-year concession period, but which oftentimes has little relationship to the actual cash flows. An investor looking at the reported profit, the most common yardstick for analysis, would see strong growth from 2001 to 2010 and fairly steady, if unexciting, earnings between 2011 and 2015. That would have given investors, lenders and creditors the confidence to keep funding the company’s expansions. If nothing else, the profits allowed the company to pay dividends (despite negative cash flows), which kept shareholders happy. The underlying cash flow, however, paints a vastly different picture. The company spent $917.9 million on capital expenditure and acquisitions from 2001 to 2010 and nearly $3 billion between 2011 and 2017. But the total actual cash flow from operations, after interest and dividends for perpetual preference shares and capital securities, rose from $181.5 million (from 2001 to 2010) to only $272.2 million from 2011 to 2017. During the entire 17-year period, the company’s ability to generate cash falls way short of its capital and financing requirements. By rearranging the presentation of the cash flows, it is quite clear that the company was undercapitalised and not generating sufficient cash from all of its investments. It ended up with a deficit cash flow every single year, except in 2003, the bulk of which was funded by borrowings. For instance, the company paid dividends on both perpetual securities totalling $269.8 million between 2011 and 2017. If the dividends were interest payments, the reported pre-tax profit totalling $156.1 million for the entire period would turn into a loss of $113.7 million. In addition, the manoeuvre significantly understates gearing — by boosting the equity base with what is, for all intents and purposes, really debt. That, in turn, probably enabled it to borrow more than it otherwise should. 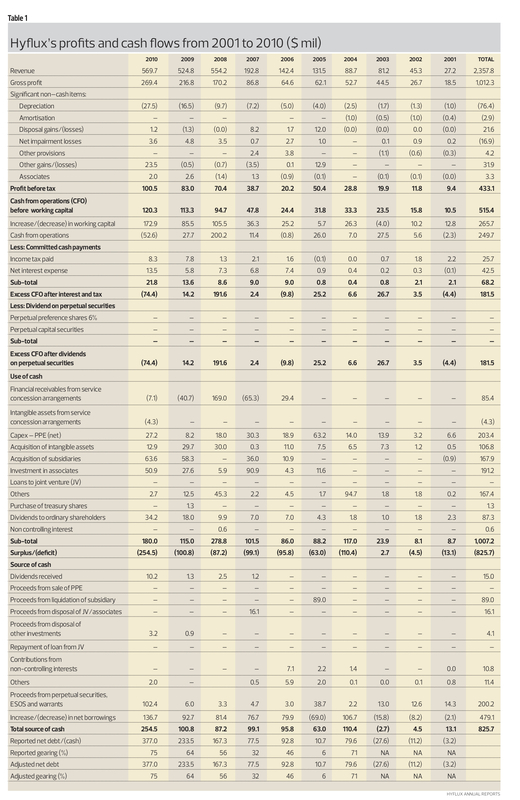 In 2014, for example, net gearing would have stood at 326% if we were to adjust both its equity and debt positions for the two perpetual securities, instead of the reported 51% (see Table 2). Make no mistake: Hyflux’s audited and unqualified financial statements are in compliance of all prevailing accounting standards. The use of perpetual securities is allowed and gaining in popularity. But I believe there is a strong case here that they must be better represented in financial statements. As I wrote last week, there is useful information to shareholders and lenders that is currently outside the scope of financial reporting but which companies are able to provide. And some of these accounting standards have removed useful financial details and aggregated them into nonsensical data. Would Hyflux’s investors have made the same decisions if all of these factors were made clear to them at the outset? The Global Portfolio was up 0.7% last week, boosted by gains from Malayan Flour Mills and price recovery for China Sunsine Chemical Holdings, and partially offset by losses from Nine Dragons Paper Holdings and DIP Corp. 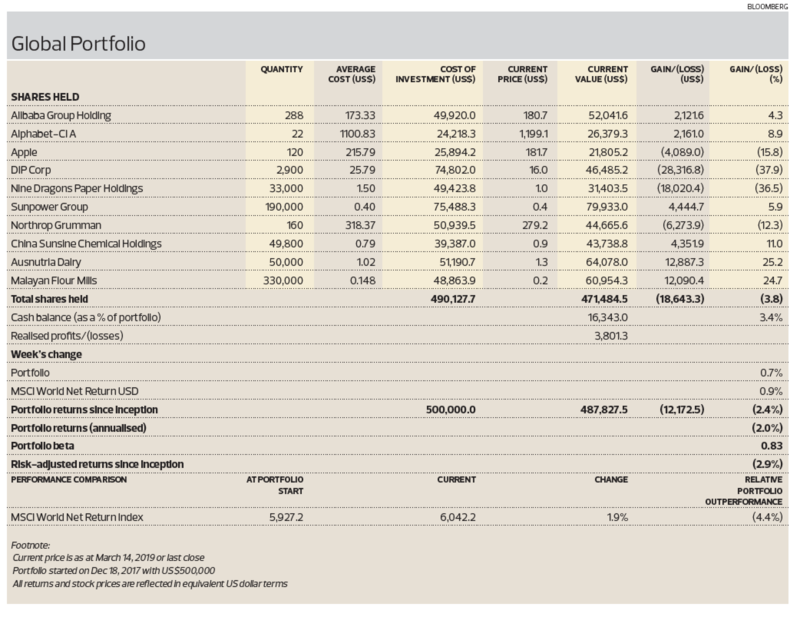 The gain pared total portfolio losses (since inception) to just 2.4%. Over the same period, the MSCI World Net Return Index is up 1.9%.